Hello! 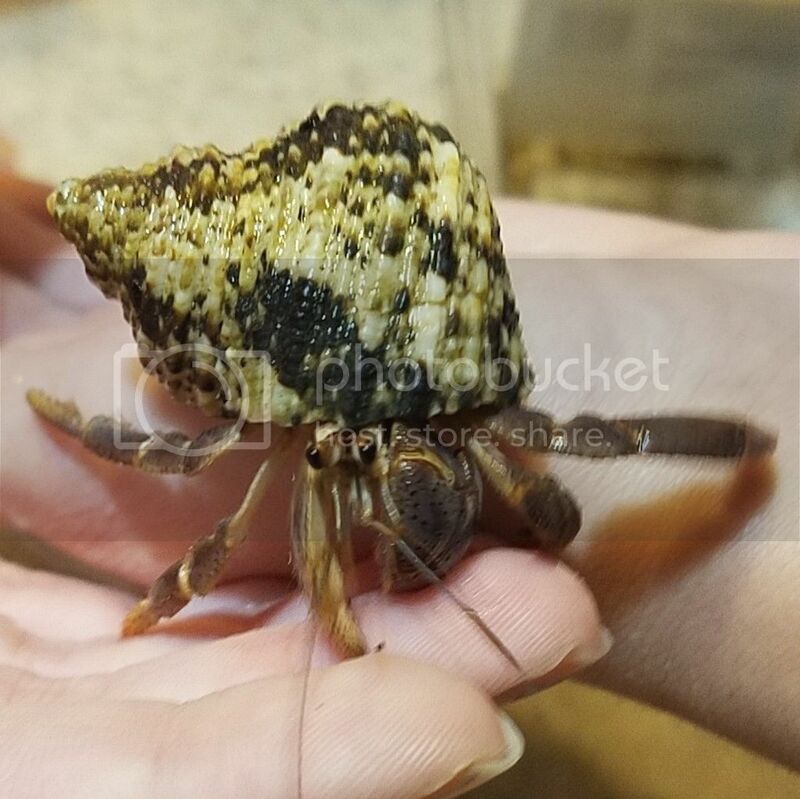 I have had my two small crabs in a ten gallon for half a year now (I'm upgrading soon!) And I have a few tips to make the most of the space you have. A cocohut will be greatly appreciated by your crabbies for the extra place to hide despite the room it will take up. The fake plant is a wonderful idea, mine loved theirs before it was removed because of chewing reasons. I got this vine thing from a pet store (the smallest kind) that I can bend to fit in the space. My crabs love climbing all over it! Cholla wood is a great way for the crabbies to reach new heights in their tank! Depending on the heaters you have, you may need another one. 80 degrees is the recommended average temp. As for humidity, it's hard. Misting is helpful temporarily, but what I've found is that it only wets the sand. Moss is helpful in this area, but I have limited experience and I hope someone else can step in and provide more advice. In an averagely proportioned ten gallon, six inches of sand is the max if you still want space for everything else. In general, a ten gallon is just the start to crabbing. It will last you about half a year before you're anxious to upgrade. And your crabs will grow regardless the space you have. Only two smalls will fit in a ten gallon, once they get bigger a twenty is in order. Here's a picture of my previous setup (the fake plant has since been replaced by a spider plant that didn't fare well) Hope more advice is offered! So far what you're doing is pretty good! Substrate needs to be at least 6 inches, or three times as deep as your largest crab. It should be moistened with dechlorinated fresh or salt water to start (then just dechlor fresh used after that), and be sand castle consistency. Most of us use a mixture of 5 parts sand to 1 part Eco Earth. It not only holds it's shape well, but also helps with humidity. Your humidity is too low, it should be 80%, or even more. What are you using for a heat source? What do you have for a lid on the tank? Hello and thank you for your comment!!! I have an aquarium topper on my 10gal tank and it is FULL of moss that keeps the humitity up in the bottom half of the tank, on top of that there is cling wrap keeping the humitity in the top layer (moss pit/climbing). The humitity is always around 75-80 after a misting and all through the day, I've read that is your humitity is at 80% it will grow mold but it hasn't yet so idrk. The substrate is deep enough for my crabs to both submerge in it but...there is always room for improvement Thank you for your comment. I don't have a heat source because my house always stays at 75degrees to 80degrees (and the crabs room is always the hottest in the house). I plan to purchase a repti-heating pad for the side of the tank during the summer when my house is a bit to cool for the little guys. Thank you for all of the tank decor ideas!!! 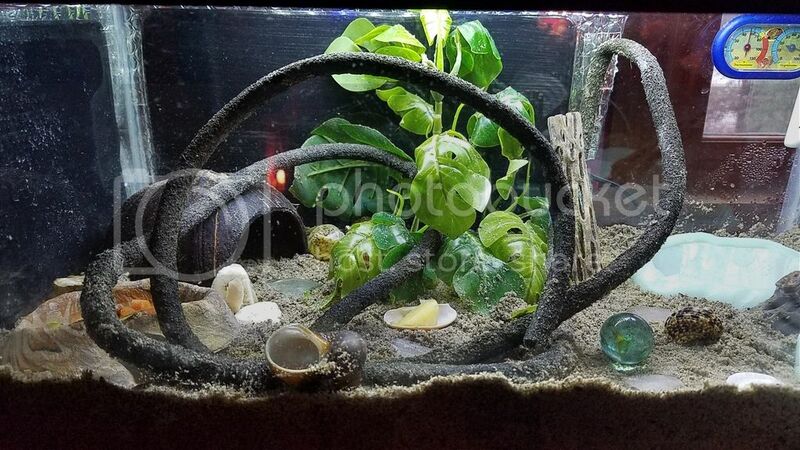 I will definatly try out some of those and I plan on purchasing a climbing background/net and some more plants soon!!! Mold isn't harmful to the crabs, it's only a problem if their human has allergies. There is no such thing as 'too high' humidity for crabs, but at least 80% is recommended. Crabs need the humidity to breathe through their modified gills. When crabs molt, they make tunnels and caves. If another crab goes digging and comes across a molting crab, they can kill it. That's why substrate is recommended to be at least 6 inches or three times as deep as your largest crab, not just to submerge but to have enough space for everyone to dig happily and safely. Thank you both for the wonderful and helpful comments I actually just did add about 3 more inches to my crabitat so that makes it about 5 1/2 to 6" deep now!!! I moved things around in their tank and added some climbing material. (they enjoy checking everything out) Thanks to all of your helpful comments I have made some improvements to my tank and am much happier with their home now!!! Thank you all!!! Your humidity is too low, it should be 80%, or even more. As long as it is above 70%, it is fine. However, they certainly do better and respond - more active - when the humidity is around 75% - 85%, and also offers you a bit of leg room to ensure it doesn't drop too much. Thanks for the correction, Aussie. I suppose I am using the old 80/80 for temp and humidity - which is half way between the ideal 75-85%, LOL. Here are images of tank toppers.